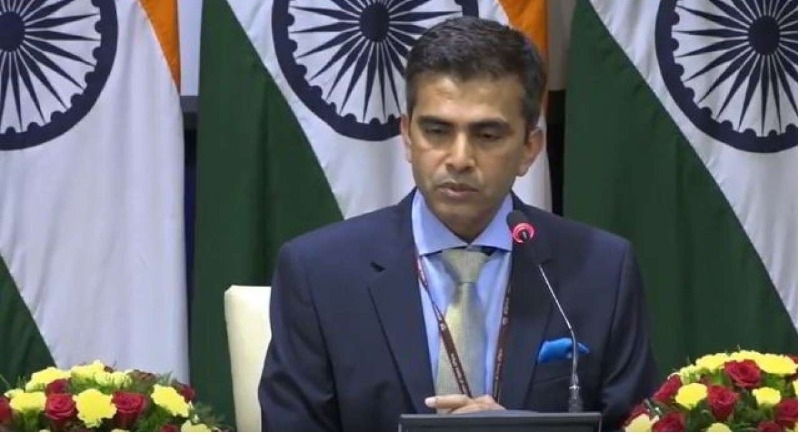 New Delhi, August 10: The Ministry of External Affairs (MEA) spokesperson Raveesh Kumar on Thursday provided detailed information on various issues including National Register of Citizens (NRC), extradition of Mehul Choksi, Vijay Mallya and Nirav Modi, Indo-Russia relations, BIMSTEC summit etc. During the press conference, MEA spokesperson Raveesh Kumar said that the recent filing of NRC for Assam will not negatively impact the country's relations with Bangladesh. "The Bangladesh Government has taken the view that the ongoing process is an internal matter of India. We do not apprehend any impact on our relationship with Bangladesh, which remains excellent," he said. "We have been in close touch with Bangladesh Government, both prior to and following the issuance of the draft. At all points, we have repeatedly assured them that it is still a draft list, prepared under the orders of the Supreme Court and the process of identification of citizens of Assam is still underway," Kumar added. Notably, nearly 40 lakh people were not recognized as citizens of India when the draft, which incorporated the names of 2.89 crore people out of 3.29 crore applicants, was released on July 30. On being asked PM Modi’s visit in Nepal for the upcoming BIMSTEC Summit, the MEA spokesperson downplayed the question and said that this is a speculative question. “We know that first Nepal have to announce the BIMSTEC Summit, then we have to announce the confirmation as to who is going and then we come down to organizing of bilateral meetings and then exactly what is going to be discussed,” Raveesh Kumar stated. On being asked about a military pact signed between Russia and Pakistan in which the Russians will be training Pakistani soldiers, Raveesh Kumar asserted that New Delhi and Moscow has a very special relationship and also privileged strategic partners. “Our relations are based on trust and respect for each other’s core interests and sensitivities,” he added. “We issued a gazette notification which you all must have seen, we did that on August 3, which deducts that the provisions of our Extradition Act of 1962, that shall apply with respect to Antigua and Barbuda with effect from 2001 i.e. when Antigua and Barbuda notified India as a designated Commonwealth country under the provisions of Extradition Act,” he added. Notably, a person may be extradited to a designated Commonwealth country or a state with which there are general or special arrangements or a bilateral treaty. The Government of Antigua and Barbuda notified India as a designated Commonwealth country in 2001. “Vijay Mallya, we are aware that the extradition request was sent to the UK Government in February 2017. Presently the matter is pending adjudication before Westminster Magistrate’s Court in London. The extradition hearing began in December 2017 and the last hearing was held on July 31 where they asked for some addition information. We understand that the matter again will be heard on September 12, 2018 and we will continue to press upon them to have all efforts made to bring him back to India,” he added.